Description of the Battle Phase One. Dispositions of the Armies: During the night of 8-9 June 1862, Winder's ``Stonewall'' Brigade was withdrawn from its forward position near Bogota and rejoined Jackson's division at Port Republic. CS pioneers built a bridge of wagons across the South River at Port Republic. Winder's brigade was assigned the task of spearheading the assault against US forces south of the river. Trimble's brigade and elements of Patton's were left to delay Fr‚mont's forces at Cross Keys, while the rest of Ewell's division marched to Port Republic to be in position to support Winder's attack. Phase Two. US Deployment: Brig. Gen. E. B. Tyler's brigade joined Col. Samuel Carroll's brigade north of Lewiston on the Luray Road. The rest of Shields's division was strung out along the muddy roads back to Luray. General Tyler, in command on the field, advanced at dawn of 9 June to the vicinity of Lewiston. He anchored the left of his line on a battery positioned on the Lewiston Coaling, extending his infantry west along Lewiston Lane (present day rte. 708) to the South Fork near the site of Lewis' Mill. The right and center were supported by artillery (16 guns in all). Phase Three. CS Advance on the Left and Center: Winder's brigade crossed the river by 0500 hours and deployed to attack east across the bottomland. Winder sent two regiments (2VA and 4VA) into the woods to flank the US line and assault the Coaling. When the main CS battle line advanced, it came under heavy fire from the US artillery and was soon pinned down. CS batteries were brought forward onto the plain but were outgunned and forced to seek safer positions. Ewell's brigades were hurried forward to cross the river. Seeing the strength of the US artillery at the Coaling, Jackson sent Taylor's brigade to the right into the woods to support the flanking column that was attempting to advance through the thick underbrush. Phase Four. US Counterattack: Winder's brigade renewed its assault on the US right and center, taking heavy casualties. 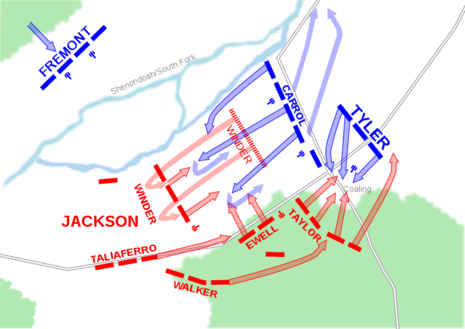 General Tyler moved two regiments from the Coaling to his right and launched a counterattack, driving CS forces back nearly half a mile. While this was occurring, the first CS regiments probed the defenses of the Coaling but were repulsed. Phase Five. Fighting at the Coaling: Finding resistance more fierce than anticipated, Jackson ordered the last of Ewell's forces still north of Port Republic to cross the rivers and burn the North Fork bridge. These reinforcements began to reach Winder, strengthening his line and stopping the US counterattack. Taylor's brigade reached a position in the woods across from the Coaling and launched a fierce attack, which carried the hill, capturing five guns. Tyler immediately responded with a counterattack, using his reserves. These regiments, in hand-to- hand fighting, retook the position. 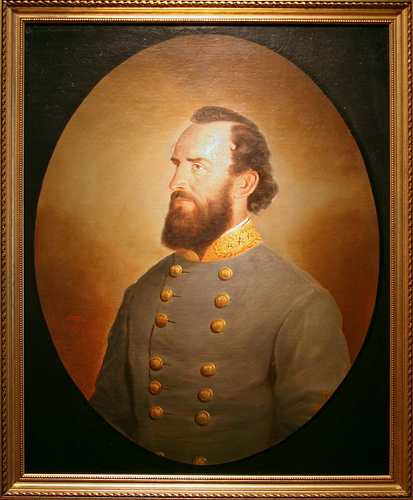 Taylor shifted a regiment to the far right to outflank the US battle line. The CS attack again surged forward to capture the Coaling. Five captured guns were turned against the rest of the Union line. With the loss of the Coaling, the Union position along Lewiston Lane became untenable, and Tyler ordered a withdrawal about 1030 hours. Jackson ordered a general advance. Phase Six. 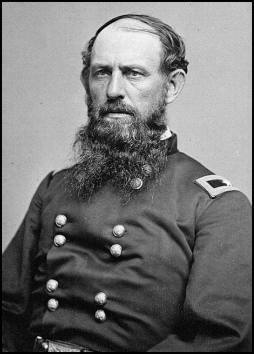 Tyler's Retreat/Fr‚mont's Advance: Taliaferro's fresh CS brigade arrived from Port Republic and pressed the retreating Federals for several miles north along the Luray Road, taking several hundred prisoners. The Confederate army was left in possession of the field. Shortly after noon, Fr‚mont's army began to deploy on the north bank of the South Fork, too late to aid Tyler's defeated command. Fr‚mont deployed artillery on the high bluffs to harass the CS forces. Jackson gradually withdrew along a narrow road through the woods and concentrated his army in the vicinity of Mt. Vernon Furnace. Jackson expected Fr‚mont to cross the river and attack him on the following day, but during the night Fr‚mont withdrew toward Harrisonburg. The Battle of Port Republic was fought on June 9, 1862, in Rockingham County, Virginia, as part of Confederate States Army Major General Thomas J. "Stonewall" Jackson's Campaign through the Shenandoah Valley during the American Civil War. Port Republic was a fierce contest between two equally determined foes and was the most costly battle fought by Jackson's Army of the Valley during its campaign.